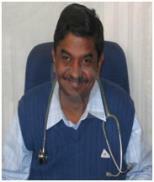 Dr. R. Murlidharan, MBBS, MD(Medicine), DM(Endocrinology), is a Consultant Endocrinologist at Fortis Hospital, Mohali. Prior to this, he had an enriching stint as Associate Professor in the Department of Endocrinology at the premier institute of Asia, PGIMER, Chandigarh for 14 years. After completing his basic medical studies(MBBS), he went on to complete his post graduation in Medicine, followed by super specialization in Endocrinology at PGIMER, Chandigarh. Dr. Murlidharan is well trained and has huge experience in treating common as well as complex problems related to endocrinology and diabetes. Dr. Murlidharan is well known for his work in the region. To his credits, he has published a number of scientific research papers and articles in the domain of endocrinology & diabetes in various peer reviewed journals. Being a keen academician, he actively participates in workshops and orations to boost his knowledge & skills to match international standards. ***Doctor has Waiting time of 6-7 Months for His appointment, Which is shocking and Not Feasible. Means a patient has to carry Disease in his body for next 6-7 Months. How Possible.